In Allplan 2014, there is a new possibility to exchange reinforcement with other software. These objects are now included in the IFC export and import of Allplan 2014. 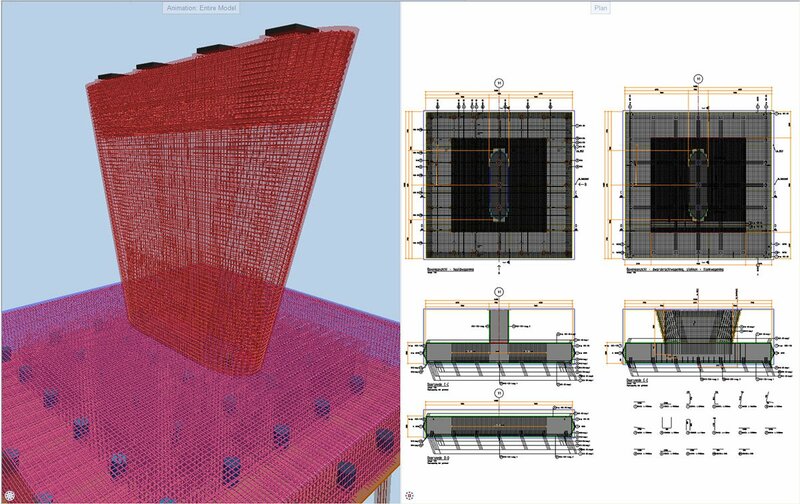 In previous versions of Allplan, it was possible to export reinforcement to IFC as 3D-geometry, but not as "real" reinforcement objects. When importing an IFC file, only 3D-objects were used. Now, with Allplan 2014, the BIM approach can take the next step with the exchange of reinforcement. When exporting reinforcement from Allplan to IFC, it is not only possible to import the data to another CAD/CAE program, but also the use of the IFC file itself is interesting. With an IFC file, it is possible to use a variety of software programs to do collision check, integrate planning, etc. IFC-viewers and model checkers, like for example Solibri, can be used to view the model or to perform collision checks. The soon to be released bim+ platform (www.bimplus.net), an open cloud based collaboration platform for BIM projects, offers many device independent (incl. mobile) apps to visualize, connect and collaborate, delivers many BIM services like status management, clash detection, revision management, issue tracking, rights & roles. Also an open API is available to integrate your own applications with our platform. The bim+ platform is fully IFC compliant. Another possible use case is importing an IFC file with reinforcement. When you receive such an IFC file with real reinforcement, you can import it into Allplan to continue work on the 3d-reinforcement model or to further refine it. You can also use the powerful Allplan reinforcement detailing tools to create the reinforcement drawings of this existing IFC bar reinforcement model. In the past, the exchange of practical reinforcement between Allplan and Scia Engineer was possible through file formats *.a and *.esa. This reinforcement was already recognized as native Allplan reinforcement, but there were certain limitations for form or placement. Now the exchange in both directions has improved thanks to the reinforcement in IFC. When creating practical reinforcement in Scia Engineer, the reinforcement can now be imported in Allplan to be used as native Allplan reinforcement. In this case, the user can further change bar shapes or placements, or add new bars between the imported ones. Then the reinforcement drawings can be made. In the other direction, the export of reinforcement from Allplan via IFC to Scia Engineer can be used to calculate the real deformation of structural elements. Also existing bar reinforcement in Scia Engineer can be updated by importing an IFC file with bar reinforcement from Allplan.